An activity-based provocation about our addiction to the visual and how it is other senses, like touch, smell and hearing, that are key to designing the future of multimodal user experiences for wearable technologies and more. People will learn the complexities of our senses, how they interact and how they work to deliver emotion and information. Working in teams, people will communicate thru touch, learn about ideas of sensory substitution and augmentation, discuss the importance of metaphor and gesture and prototype the potential of future products or services using all our senses. 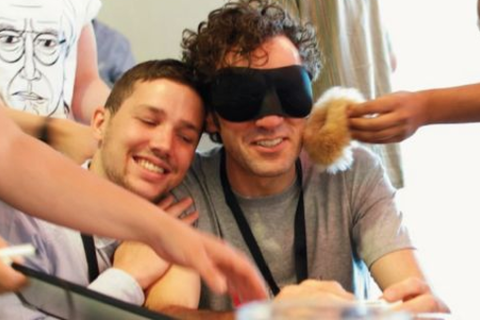 Split into four sessions, the workshop uses play to build knowledge and creates new personal experiences for product designers, UX specialists and artists. 1) Introduction to Multimodal UX - how senses interact and ideas of accessibility. Practical exercise on communicating through touch. 2) Metaphor and meaning - understanding personal, social and cross-cultural meaning of symbols and gestures. Practical exercise in gestural communication. 3) Sensory Substitution - learning about the current state of technologies and their utility in general user experience. Practical exercise in using sensory substitution app. 4) Sensory Augmentation - the possibilities of enhanced information and senses through innovative products and services. Practical session on imagining future devices and services. Bringing together research in neuroplasticity, accessibility and sensory processing with new ideas of culture and perception, the workshop is about discovering more about ourselves so we can create more for others. - No special requirements but iPhones and headphones are useful for one session as we will use an iOS sensory substitution app. Alastair Somerville is an accessible communication consultant. Working with clients, including the Science Museum, BBC, and Scottish Parliament, he has developed new technologies and techniques for making information more available and comprehensible by people with both physical and cognitive impairments. Using 3D printing, tactile printing systems and Near Field Communication technology, his work is used in museums and schools in the UK and USA. He works with universities on sensory cognition and he specialises in tactile design and haptic comprehension. He has provided workshops on sensory user experience in London, Cambridge and Bristol.